Life went into slow motion as we took one bite of this beautifully spiced bread. My usual fix for overripe bananas is to add them to pancake batter but this time I wanted to try something new. As I am slowly learning and exploring baking, a banana bread was an easy choice. With winters at their peak right now, adding some spices sounded perfect! 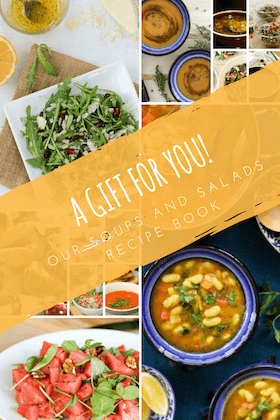 The recipe is inspired from Once upon a Chef. Using her basic banana bread recipe as a base, I made my own spice mix and also added roasted walnuts to give the bread an extra crunch. Banana is one of the healthiest fruits to start your day with. It provides instant energy naturally, is a mood booster, soothes the stomach and also helps in healthy digestion. Banana is rich in many nutrients, especially potassium. Potassium helps lower blood pressure, keep the heart healthy, and boost memory. 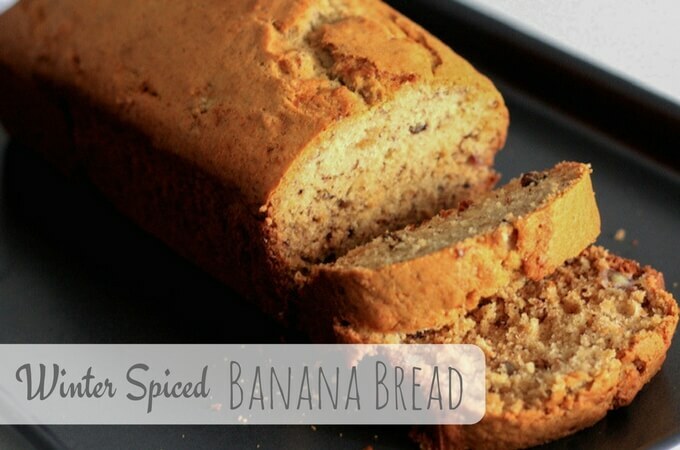 This winter spiced banana bread is great for breakfast, especially in cold weathers. In addition to healthy banana, spices like cinnamon, cloves and nutmeg help keep the body warm in winters and are also anti-inflammatory. If you like this recipe, please take a moment to rate it and/or leave your comments at the end of the blog. It will really encourage me to keep exploring, learning and improving. Preheat oven to 180ºC (350ºF) and butter a 9”X5” loaf tin. Add flour, baking soda and the spice mix to the butter mixture and combine all well. Add mashed bananas, vanilla extract and yogurt. Mix together. Beat on low speed. Gently add in the walnuts. Take a minute to enjoy the aroma of this beautiful dough! Pour into the prepared loaf tin and bake for about an hour until a skewer inserted comes out clean. 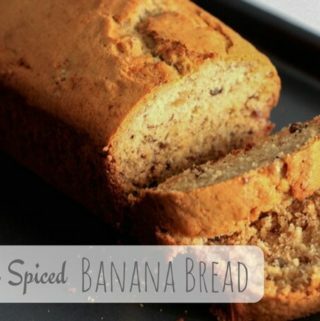 If you have impatient crowd (like mine) at home, then carefully invert the bread on a dish and dig into the goodness of this warm spiced banana bread! I’ve got to thank Dipika for gifting me this loaf tin which has been put to so much use lately and has my other cake moulds crying in the shelf. Yummy! All your cakes have inspired me to start jogging! and I kick started last week….. I used a 9X5 inch loaf tin. In India we get only one sized eggs which would be medium size if you are in US. Nuts are optional, I like the crunch of walnuts but you can easily leave them out.. and yes chocolate chips would also taste great! I love chocolate and banana combination though I haven’t yet tried it in bread..
Hi, thanks for the reply, unfortunately due to family problems at the time I didn’t get a chance to make this banana bread and the recipe ended up shoved to the back of the drawer lol… however I have some bananas that will need using up, so thought I’d give this recipe a try … now about the eggs you said you only get one sized egg in India, I’m in the UK and there are a few different sizes and they differ from us sizes a fair bit, so since the sizes seem to be complicated, can you instead weigh one of your eggs and tell me what it weighs in grams? The whole egg with the shell on.. thanks for your help. Sorry for the late response… won’t be able to weigh the eggs right now as I am travelling.. but two large size UK eggs are more less like 3 regular Indian eggs.. hope that helps! also is cardamom powder basically ginger? would ginger work? i carnt get cardamom powder. Hi, just made the banana bread, which unfortunately didn’t turn out. The bread looked fine when I took it out of the oven but about a minute later it sank.. I don’t know what I did wrong… maybe my baking soda needs replacing? I used 1 level tsp of baking soda, should it have been slightly heaped? Is there any way or extent to which maida can be substituted with wholewheat or a millet, for nutrition benefits?—Dilip. Just use wholewheat instead of maida. It will work perfectly fine! 🙂 You can also add seeds in the dough to make it healthier.